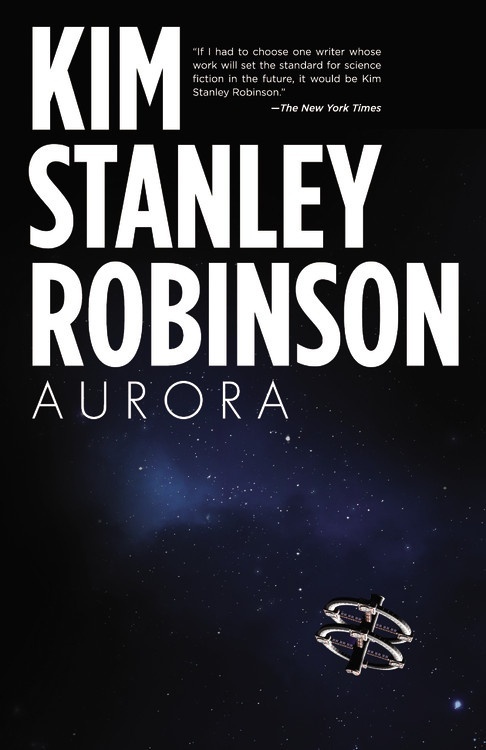 Aurora is the title of a Kim Stanley Robinson novel published in July 2015. It deals with the journey of an intergenerational interstellar spaceship with the mission to colonize Aurora, the moon of a planet in a star twelve light-years away from the solar system. As the novel begins, the ship has started decelerating to its destination, still eleven years away. /!\ Beware of spoilers! 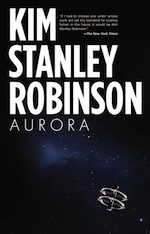 Moreso than your typical KSR novel, Aurora is more plot-driven and contains several plot twists. Freya's wanderjahr around the ship's biomes, befriends Euan. Devi dies. Arrival at Aurora. Exploration. Contamination. Euan dies. Ship inhabitants protect themselves from the Aurora settlers. Confusion. Vote on what to do next. Violence. Ship intervenes. Reveal of the fate of the twin ship. Town meetings. Settling of Iris. Half the ship departs for Earth. Trip back. Failing ecosystems, starvation. Adapting hibernation technology. Ship musings as it approaches Sol. Gravity-assisted deceleration. Separation of pods, last attempt at deceleration. Survivors on Earth, shown around, confused. Landscape restoration on a beach. Population at start of narrative: 2122. Destination: Tau Ceti star, planet E (with a moon, Aurora), planet F (with a moon, Iris). Distance from Earth: 11.9 light-years. Voyage began in 2545 CE; narrative begins year 159 (2604 CE); journey ends year 363 (2908 CE). 24 cylinders in two rings with twelve major Terran ecological zones (permafrost glacier, taiga, rangeland, steppes, chaparral, savannah, tropical seasonal forest, tropical rain forest, temperate rain forest, temperate deciduous forest, alpine mountains, temperate farmland). Each cylinder 1 km in diameter, 4 km long. Cylinders connected with each other by tunners, and to the inner ring via spokes, which is close to the central spinal axis. Rotation creates .83 g centrifugal force. "I just finished a starship novel in which people in a multi-generational starship try to get to Tau Ceti and occupy one of the planets around that star (actually a big moon of one of the planets). Problems follow..."
"My next novel is going to be about a multi-generational starship, actually. This is something my editor, Tim Holman, has been pointing out to me; that these three books will make a kind of extended argument or case." ASM: What projects are you working on now that we can look forward to? KSR: Another science fiction novel, of course; this time, about a multi-generational starship to a nearby star.